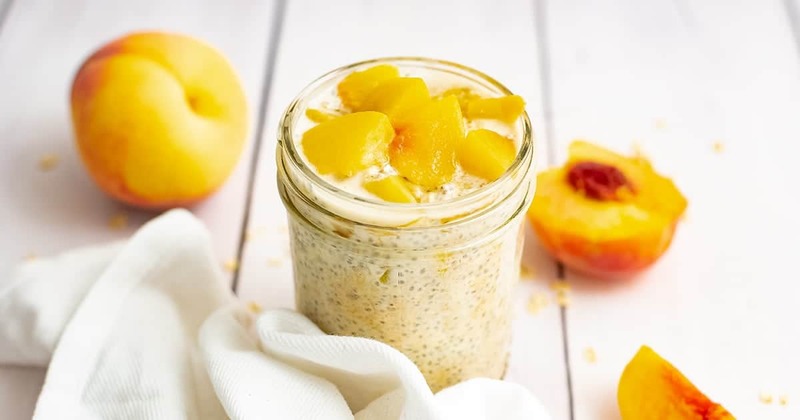 This recipe for peach overnight oats with yogurt is the perfect breakfast or snack! 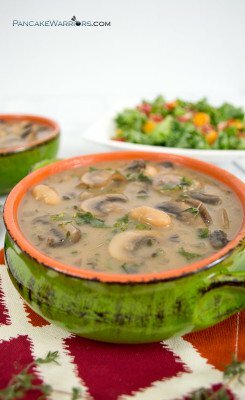 It’s packed with protein, full of fiber and could not be easier to make! No cooking required, not even the microwave! I’m sure you have heard of overnight oats before, but if you haven’t you are going to be so excited to learn about them! Essentially instead of cooking your oats, you let them soak overnight, which softens them and added bonus, makes them easier to digest too! I have to be honest, I’ve fallen in and out of love with oatmeal 3-4 times on my healthy eating journey. Like many people, I jumped on the oatmeal bandwagon as the way to start the day that will keep you full. So I would happily add 2 packets of instant flavored oatmeal to a bowl, add water and enjoy. And look around 1 hour later wondering why I was so darn hungry again. I figured it was because my metabolism was working hard from all the working out I was doing. Later I discovered that I need some protein with my breakfast or I’m going to be hungry very soon afterwards. This led me to start adding protein powder to my hot oatmeal. Which I loved, but became kind of burdensome at my desk at work. I mean really how many random bags of powders and containers can you bring in a day before you are “that weird girl”. I pushed that limit like everyday. So I stopped having oatmeal and started on the greek yogurt bandwagon. Except that left me hungry too, not enough fiber I guess? I felt like I just couldn’t win. And I refuse to be that person that brings hard boiled eggs to work or that microwaves eggs. I just couldn’t. So when I found out about overnight oats I was stoked! I could make my oats the night before. And add all the powders and fruits and toppings I wanted. And I could still enjoy it at my desk at work without all the fuss. I was hooked! And I was actually feeling pretty full and satisfied afterwards! Success! This recipe for overnight oats is made with yogurt, but I’ve also made it milk and protein powder as well! If you wanted to amp up the protein in this, you could use collagen peptides (not vegan) or protein powder as well. Can you soak uncooked oats in yogurt and is it good? YES!!! So soaking oats in water overnight helps make the oats more digestible (as it helps break down the phytic acid in the oats). But adding yogurt makes them even easier to digest! The yogurt is full of beneficial probiotics, helping your digestion and filling you up! Just be careful to choose a low sugar yogurt or you could end up feeling less than fantastic if you go into a carb overload from your breakfast of oats and sugary yogurt. 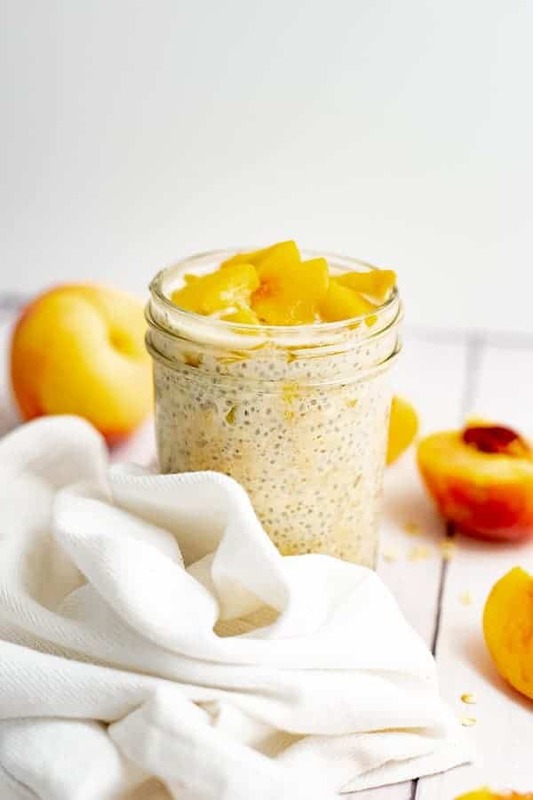 The night before, you will want to combine the oats, chia seeds, yogurt and water (or milk) in a mason jar. Stir well making sure all the oats and chia seeds are coated in the liquid. 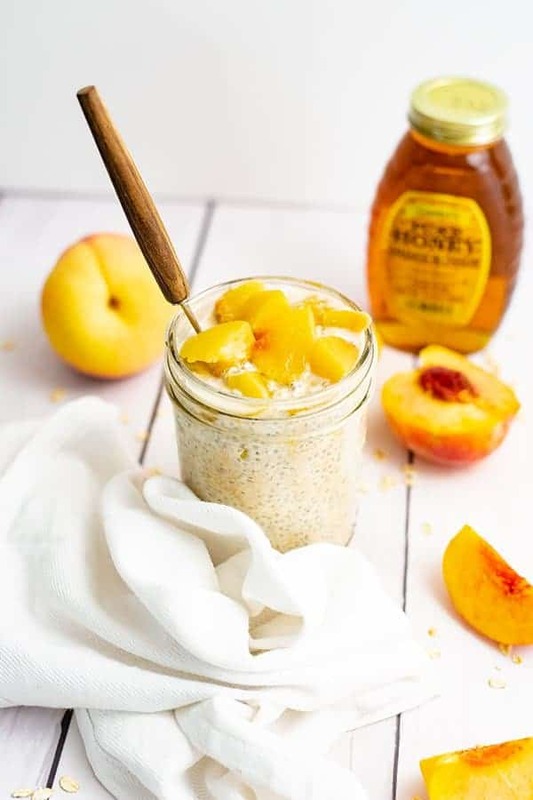 Add chopped peaches (or whatever your favorite fruit) and your maple syrup or honey to the top (no need to stir this in yet). Let the oats soak overnight in the yogurt/water mixture. In the morning, stir well and add more liquid if needed. If you feel like it is too watery, you can add some protein powder, chia seeds, ground flax or even more oats. Taste it for sweetness and adjust as needed. Put a lid on the mason jar and take with you to enjoy anywhere! Don’t forget to sprinkle on some fun toppings as well! Can you heat up your overnight oats? I like to store my overnight oats in a mason jar. 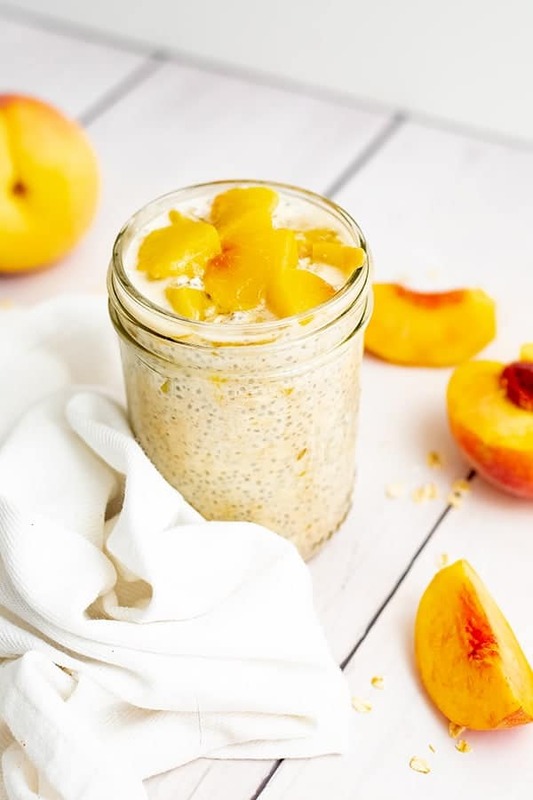 I love mason jars because they are microwaveable glass jars, so you could easily put your overnight oats in the microwave and heat up if you want! Just be careful for how long you microwave them for, as I’m not sure how the yogurt would taste boiling hot! (And watch your hands on hot glass)! When I make overnight oats with yogurt, I usually eat that cold though. That’s just me! How long do overnight oats last in the fridge? It depends. Assuming the yogurt wasn’t going to expire, more yogurts say to use them within 5 days of opening, so that would be my suggestion with overnight oats as well. 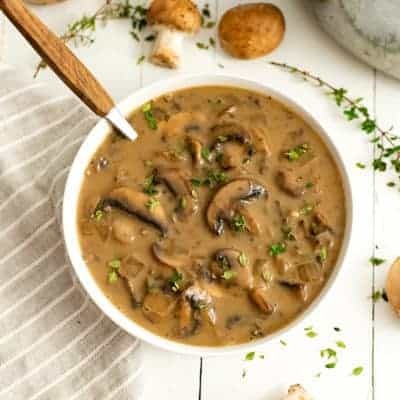 If you add a protein powder, they usually start to degrade after 24-48 hours, so just be aware of that as well (although I don’t usually worry about this). If you are trying to meal prep for the week ahead, I would start with 3 days and see how you like the texture of the oats after 3 days. The chia seeds get very plump and the oats become pretty soft after 2-3 day. With that being said, I just had a bowl of overnight oats that have been soaking for 5 days or so. They were fine and I enjoyed every last bite! What yogurt to use to make overnight oats? I prefer to use a greek style yogurt for overnight oats with yogurt recipes! I personally use the Kite Hill Greek Style Yogurt, plain in my recipes! I like that there are no added sugars and I can control the sweetness of my recipes! 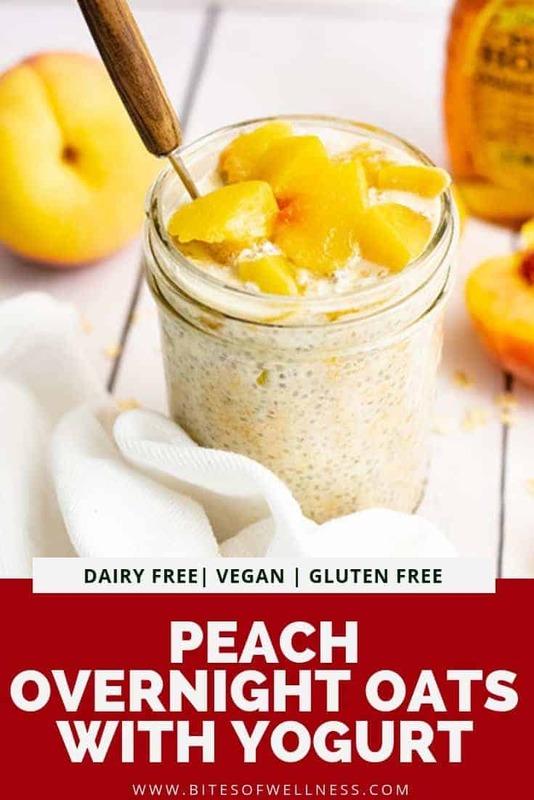 I like to add the peaches for sweetness and because I really like the combination of sweet peaches and the slightly sour yogurt flavor. 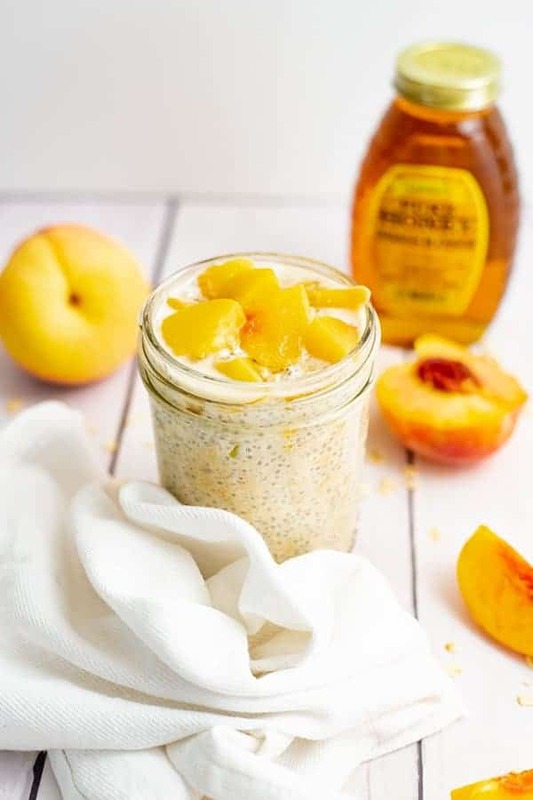 Raspberries would be really good with this recipe for peach overnight oats with yogurt as well! 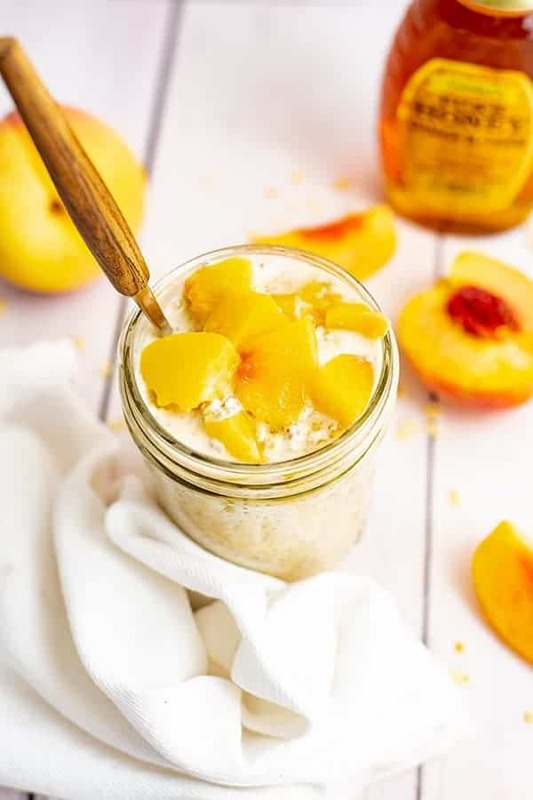 These peach overnight oats with yogurt are the perfect breakfast or snack. 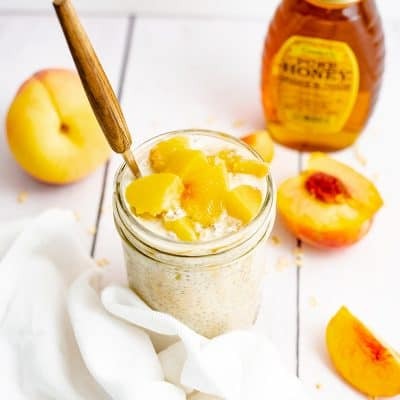 Gluten free, high in protein and fiber and vegan friendly, these overnight oats are perfect for busy mornings on the go! 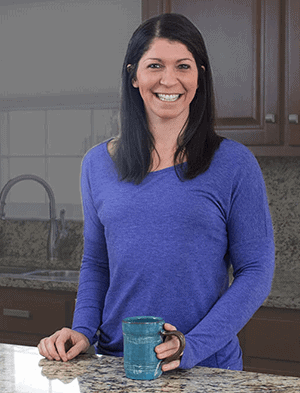 In a large mason jar, combine the rolled oats, chia seeds, dairy free milk, plain yogurt and optional collagen peptides. Stir well. Defrost the peaches and chop them up. Add the maple syrup (or honey) and peaches to the top of the oatmeal mixture. Place the jar in the fridge overnight (at least 3 hours). The morning of, stir well and add additional 1/4-1/2 cup of liquid as needed. Divide into 2 smaller jars (for easier eating) and top with your favorite topping! I really loved this! Thanks for sharing.